Some computer issues have seen this post get delayed several times - and subsequently get longer and longer! Anyway; during the last 3 weeks I've had a number of really good beers - some of which are reviewed below. Check it out, and remember to leave me your feedback on any of the beers you've had! First up was BrewDog's Black IPA from their Prototype range, a beer that unlocked God Save the Queen (Level 32). Initially, it was nicely roasty but lacking a bit in hops. It wasn't a bad Black IPA, but it didn't have the wow factor that I normally associate with BrewDog. Another beer from the new BrewDog Prototype range that unlocked a badge was the Milk Stout. I thought this was the pick of the 4 beers, and one that I'd love to see incorporated into their core range. It was slightly sweet, and had that nice chocolate/lacto thing that many Milk Stouts have going on. Highlander (Level 4), the badge for drinking Scottish beers, is the reason we're talking about it. Interestingly - 19 of my 20 Scottish beers since the introduction of the badge have been from Brewdog. James Squire's new release last Summer, The Swindler unlocked Blondes Do It Better (Level 4). This beer has been in the news recently after beating out Stone & Wood's Pacific Ale in The World Beer Cup English-style Summer Ale category. On first tasting, James Squire have swindled a Gold Medal! The beer is almost flavourless and I can't for the life of me understand how it rated so highly, unless the beer they entered in the competition is different to the packaged product... Cynical? I know! But I can't explain it any other way. I've got another one and will be revisiting in the future to confirm my previous findings. Better Together has become one of my favourite badges, I love seeing two brewers collaborate and produce something incredible! Better Together (Level 13) was unlocked by the Nomad Cross Pallet Nation, a beer brewed at Nomad with input from Pallet Magazine and Sam Calagione, of Dog Fish Head fame. It's a wonderfully complex beer, an Amber Ale with plenty of smokiness accompanied by some maple sweetness. Apparently there's some Australian spices in there as well, but they don't add much noticeable flavour. Knee Deep's hoppy beers have once again made it to our shores. The best way to sample them is from a keg, so naturally I visited Tru Bru to get my fix! Man Juice, not only evokes an image I could do without, is a seriously good IPA. It's packed full of citrus flavours, with mandarin the most prominent - I can't recall ever having a beer which was so clearly dominated by mandarin. Although it's not massively hoppy, 69 IBU's was enough to earn Hopped Up (Level 40). Hop Surplus was another Knee Deep offering that I picked up at Tru Bru. This IPA was monstrous; clocking in at 10% on the dot, it unlocked Sky's the Limit (Level 17). It's certainly not a subtle beer! It's got plenty of sweet caramel malts upfront, before being swamped by a bitter hit of pine resin and hints of citrus. The ABV is well hidden, but certainly shows itself after you finish! It's a big beer; treat it with caution. New Brew Thursday (Level 19) was unlocked by Exit's Amber Ale. This badge has continually confused me since the start, and once again it randomly arrived. This beer is part of the new core range and Exit and was a lovely example of the style. It had all the malts you'd expect from an Amber/Red, while having a nice citrusy hop bite that kept me interested. You honestly can't go wrong with any of the beers these guys produce. To celebrate the completion of my piece on the history of Grisette (see here), I opened the 8 Wired/Modern Times collaboration Halfway to Whangarei Grissette (quite why Grisette is spelled with two "s's" I can't explain...). It was beautifully funky, with Brett relatively restrained, and a nice grassy & citrusy zing. Stylistically it wasn't a Grisette, but it was a very tasty beer! Drink Like a Kiwi (Level 30) is why you're hearing about it. Richo and I caught up for the first time in ages later that night and shared a few really good beers. The first to earn a badge was the Almanac Tropical Platypus, which unlocked Pucker Up (Level 36). I was already well on the way by this point - but I vividly remember this beer. It was spectacular with kiwifruit and passionfruit both prominent flavours, as well as lovely acidity and vinous qualities - presumably from the white wine barrels it was aged in. The Almanac sours, and the IPA as well for that matter, are all awesome! I'm doing a big tasting on their stuff soon, which I will try and write up. Another beer from that night unlocked Fruits of Your Labor (Level 4). Founders Blushing Monk was the beer and I was surprised by it as soon as it was poured. I'm not sure what I was expecting, but it wasn't a bright red beer! It had a very sweet raspberry raspberry flavour initially, yet finished strangely tart. It straddled this line between, almost too, sweet and tart. It was a really interesting juxtaposition of different raspberry flavours and one I'd recommend trying. Canadian beers rarely make it to our shores. So when the Collective Arts Brew beers made it out here for Good Beer Week I had to grab some. Their Collective Project; Black IPA was a lovely example of the style. It was definitely malt drive, with roasted coffee the main flavour proponent. There's also plenty of piney hop bitterness. This was the first beer in this review to unlock two badges; Wheel of Styles, a new core badge for trying 20 different beer styles, and Hopped Up (Level 41). Last weekend Lizzie and I were driving around the western suburbs; and what trip out that side is complete without stopping for lunch at Fox in the Corn? For those who don't know; it's a pasta restaurant in Footscray with an amazing beer list, specializing in sours. After consulting with Josh I ended up starting with BrewDog's B Side: Sour Red Ale. This is the first offering to come out of BrewDog's new sour only brewery. It had all the complexity of a proper Flemish Red but is only a 4 week kettle sour, I think with pediococcus rather than lactobacillus but I may be wrong. The badge? Independence Day (2016) - for having a beer within 3 days of July 4. Epic's Hopdozer unlocked Paint the Town Red (Level 8). These New Zealand brewers are known for their copious use of hops and this holds true with this Red Ale. This was a pretty sensational example of a hoppy Red Ale/Red IPA, Red IPA is a term I'm not huge on - but similarly to Black IPA it does explain what you'll get. This had nice maltiness and wonderful hop bitterness! I'm looking forward to get back to the shop and buy more! A lunchtime work trip to Dr Morse for Lizzie's birthday unlocked Heavy Weight (Level 44). It was a particularly cold Melbourne's winters day and the Akasha From the Shadows Porter was the only way to go. The beer was nice and malty, with roasted malts dominant and hints of chocolate and coffee becoming more prominent as it warmed. For the ABV(5.5%) it drank beautifully, with a thick creamy body. I will be keeping my eyes peeled for this in the future. After a long day in the cold at the footy, I knew it was time to crack the Townshend's Flemish Stout that'd been in my fridge for a few weeks. As soon as I smelt the beer, I knew it was exactly what I was after! This beer had lovely chocolate notes that contrasted beautifully with this complex sour wood and cherry flavour - which was very reminiscent of a Flanders Red. It was a touch over carbonated for my liking, but this was a very minor issue for me. Drink Like a Kiwi (Level 31) was the badge. 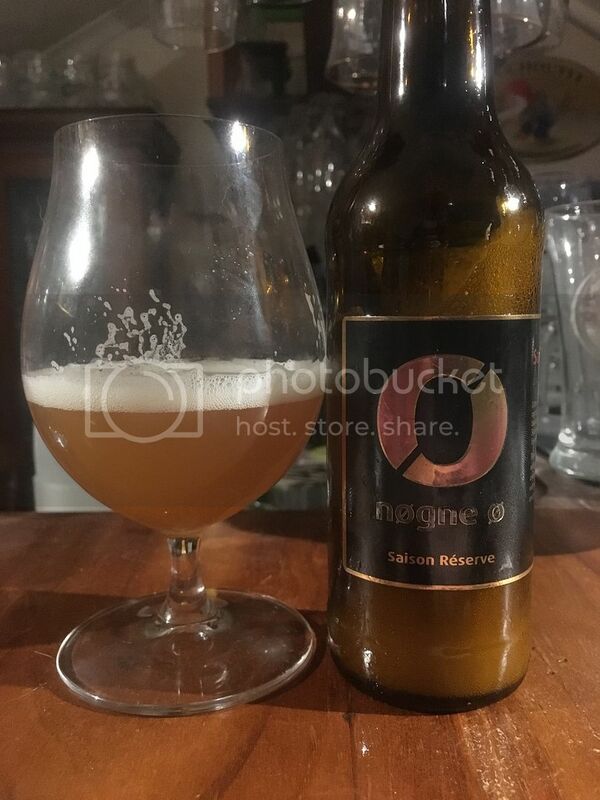 Last but not least was the Nøgne Ø Saison Reserve, which unlocked Trip to the Farm (Level 16). This beer gushed as violently as any beer I've ever had before. The best part of two thirds of the bottle hit the ground and unfortunately not my glass. What little I did get to taste was a little disappointing. I was quite surprised to not pickup any elements of the wine barrels this beer is aged in (although their contribution may have been the gushing...). There was a nice orange peel taste but it wasn't particularly strong. I thought this was a bit weaker that what I've come to expect from Nøgne Ø.